In 1964, historian Lt. Col. Joseph B. Mitchell published a compact book, Twenty Decisive Battles of the World, an expansion of Sir Edward Creasy's most famous work from a hundred years past, updating it into the 20th Century. 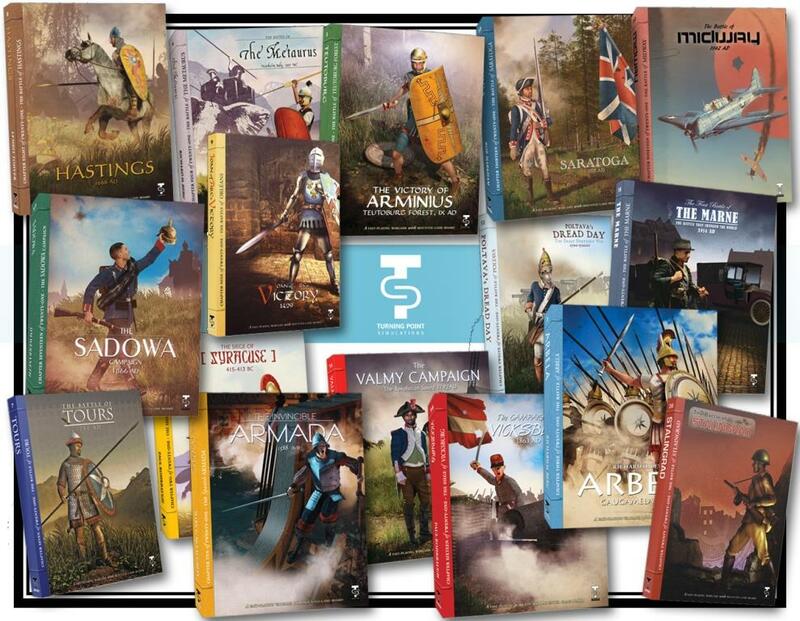 Most gamers are familiar with Mitchell and Creasy's classic of military history, Twenty Decisive Battles of the World. We thought it would be particularly great to be able to game all 20 of those battles. The people who bring you Against the Odds Magazine have launched a sister company, Turning Point Simulations, to create a new sort of gaming experience...classy, rather small, boxed, mounted boards or quality playing cards...all games with low complexity but high challenge and play value. All 20 of the book's battles, from Marathon to Stalingrad will be included. Published at the rate of 4 per year. Available individually, or choose the entire series for a remarkable single price. Yes, you can sign on to receive ALL 20 of these games for just $550—and that price includes priority shipping to the US. For Canadian customers, the series price is $725, and for other international customers, the series price is $850, also including high-speed shipping. We also offer a "Honeymoon" option that lets you buy just the first four games and keep open your option (and benefits) to sign up for the entire series. And, those who sign on to collect the entire series from us get an added bonus—which will not be sold individually or in stores. Twenty Decisive Battles stopped at Stalingrad. Those who collect the series will receive our "entry" into the suggested upgrading of the book—a 21st Decisive Battle, perhaps the most potentially decisive battle of all time... . Yours when you choose to receive them all from us and only when you choose to receive them all from us. Some of the games come from the "hall of fame" of game designers—Berg, Markham, Prados. Others come from those who have proven themselves with a few quality designs over the past 15-20 years, like Mark McLaughlin and Ed Wimble, while still other designs come from strong up-and-comers, like Hjalmar Gerber or Lembit Tohver. These games will all be distinct designs—there is no single "Decisive Battles" ruleset that gets modified 20 different ways. But they will all share some common goals... interest...playability...quality components. While the series will be aimed to "look" like a series (and look sharp on a bookshelf), these games are all meant to be played. Twenty Decisive Battles of the World—the Game Series. It's here. Climb aboard and enjoy the whole ride.